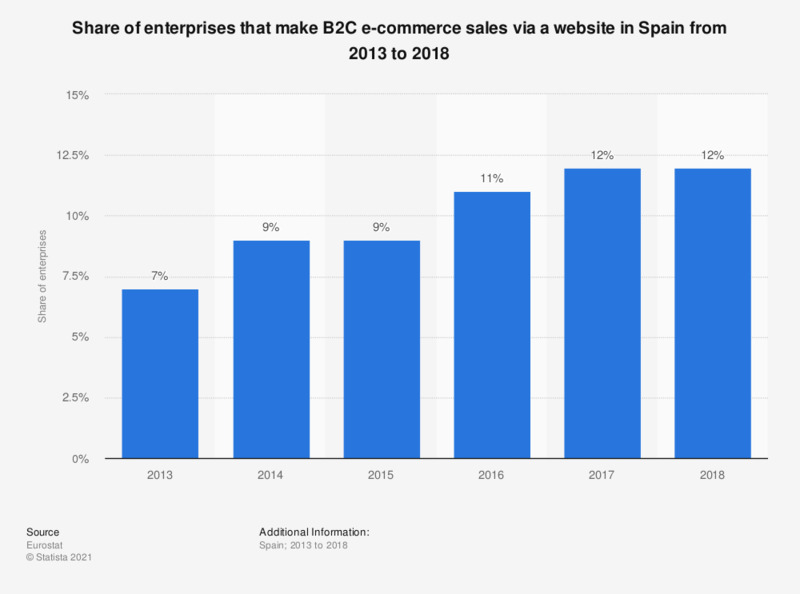 This statistic displays the share of enterprises that made B2C e-commerce sales via a website in Spain from 2013 to 2018. In 2018, 12 percent of enterprises in Spain made B2C e-commerce sales through a website. All enterprises, without financial sector, are included (10 persons employed or more). Data given are based on the annual Eurostat Model Questionnaires on ICT (Information and Communication Technologies) usage and e-commerce in enterprises. The aim of the European ICT usage surveys is to collect and disseminate harmonised and comparable information on the use of Information and Communication Technologies in enterprises and e-commerce at European level. Data coverage corresponds to code E_AWS_B2C of INDIC_IS (Information Society Indicators).